Japanese Wagyu All of our Wagyu is grade A5, with a BMS of 8-12. We hand select each piece to ensure that it is of the highest grade available. We recommend cooking Wagyu no more than medium rare to enjoy the incredible texture and flavor that is unparalleled. All of our Wagyu is grade A5, with a BMS of 8-12. We hand select each piece to ensure that it is of the highest grade available. We recommend cooking Wagyu no more than medium rare to enjoy the incredible texture and flavor that is unparalleled. Your order will come with the Japanese documents including the lineage, noseprint, grading score and a Certificate from the producer. The certificate is in English, and the other documents may be in Japanese. Definitely something you'll want to show your guests as they enjoy this beef. 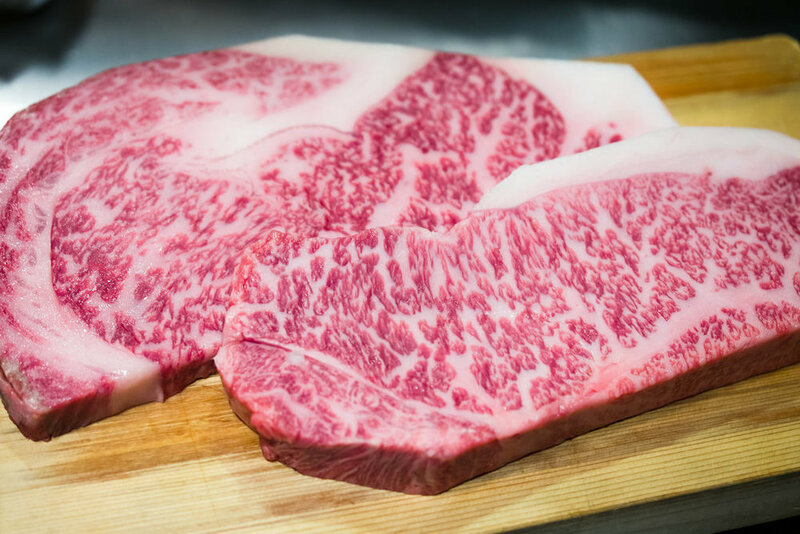 There are some grades for WAGYU beef, including the meat of Japanese Black (Breed of cow most used in Japan for Wagyu), and A5 is the highest grade given only to the finest beef. The standards of grading beef consist of Yield Grade and Quality Grade. “A” of “A5″ means the yield grade, while “5″ shows the quality grade. Moreover, the Japanese beef grading system has 5 quality grades (The USA has just 1). They are (1) marbling, (2) meat color and brightness, (3) firmness and texture of meat, and (4) color, luster and quality of fat. Yield Grade, in short, is the standard set to evaluate cutability (the proportion of meat obtained from a certain part of cattle body). According to the yield grade, score A, B or C is determined. Marbling is flecks or thin strips of fat in beef. In Japanese, “SASHI”. Marbling is classified into five grades. Furthermore, these five grades are ranked from No.1 to 12 by BMS (Beef Marbling Standard). Beef color and brightness are evaluated by visual appraisal. The firmness and texture of beef are also evaluated by visual appraisal. The color, luster and quality of fat is evaluated by the beef fat color standards, while evaluation of luster and quality of fat is by visual appraisal. Thus the grade of beef is classified along the standards of Yield grade and Quality grade. Quality grade also has several items of evaluation. In the quality grade, the lowest score from the four items of the yield grade is adopted. In other words, even if grade 5 was given to marbling, color and brightness, and firmness and texture, and only fat assessments was grade 4, the quality grade of this beef is classified as grade 4. Quality grading is severely done. Through these strict evaluations, Japanese Black beef there are classified into 15 grades from C1 to A5. And even among the A5 grade, marbling varies from No.8 to No.12.